Global economies today are increasingly based on knowledge and information. As knowledge-based economy grows, the need for greater synergies between government, science and business becomes more critical. In a few years' time, a country's economic growth will depend on its ability to bring knowledge, technology, entrepreneurship and innovation to the center of its development agenda. In order to achieve this greater cooperation, strategic partnerships between research and industry should be fostered, rightfully through governmental policy interventions and innovative funding programmes. In most cases, research innovations were not able to make it to the market because they were not tailored to local needs. 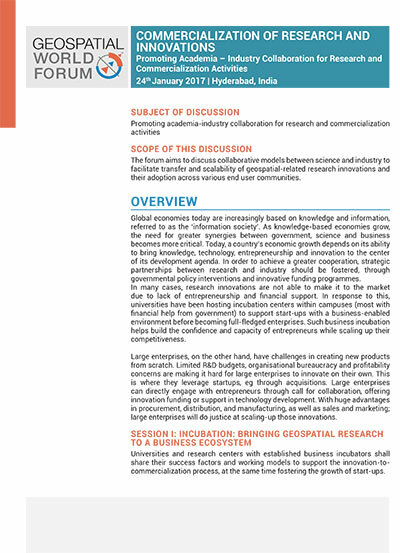 It is essential for any research to be conceptualized with entrepreneurship in mind from the beginning to ensure scalability of its end products. In addition to educational reforms, universities have been hosting incubation centers within campuses (most with financial help from government) to support start-ups with a business-enabled environment before becoming full-fledged enterprises. Such business incubation helps build the confidence and capacity of entrepreneurs while scaling up their competitiveness. Large enterprises, on the other hand, have challenges in creating new products from scratch. Limited R&D budgets, organisational bureaucracy and profitability concerns are making it hard for large enterprises to innovate on their own. This is where they should leverage startups. Large enterprises can directly engage with entrepreneurs through call for collaborations, offering innovation funding or support in technology development. With huge advantages in procurement, distribution, and manufacturing, as well as sales and marketing; large enterprises will do justice at scaling-up those innovations. Universities and research centers with established business incubators shall share their success factors and working models to support innovation-to-commercialisation process, at the same time fostering the growth of start-ups. Both academia and industry shall share their thoughts and experience on the best engagement model that could improve the effectiveness of collaboration between businesses and researchers, ensuring sustainable commercial outcomes. Geospatial technology today has made its way across diverse industries. New demands for geospatial-enabled solutions are continuously emerging, creating business opportunities for enterprises. With the right strategy, enterprises that orient their business interest towards scaling-up innovations will be able to prosper on this latest trends. Academia and industry representatives shall discuss the importance of research scalability and how to factor the latest market demands into research conception.